This article is about the safety. For the wide receiver of the same name, see Dexter Jackson (wide receiver). Dexter Lamar Jackson (born July 28, 1977) is a former professional American football safety in the National Football League (NFL). He was drafted by the Tampa Bay Buccaneers in the fourth round of the 1999 NFL Draft. He played college football at Florida State. Jackson earned a Super Bowl ring with the Buccaneers in Super Bowl XXXVII and was also named MVP. He also played for the Arizona Cardinals and Cincinnati Bengals. Jackson attended Florida State University and was a Human Science Major and a letterman in football. In football, he was named as an All-Atlantic Coast Conference as a junior, and he finished his college football career with 194 tackles, 7 interceptions, 16 passes defensed, one forced fumble, one fumble recovery, and blocked four field goals. Jackson was drafted by the Tampa Bay Buccaneers in the fourth round (113th overall) of the 1999 NFL draft. He made his NFL debut versus the Denver Broncos. Jackson was the MVP of Super Bowl XXXVII, recording two interceptions. His margin of victory for the award was the "fan vote" in which he gained four votes based on internet polling. Were it not for the fan votes, Simeon Rice would have won the award. He was the first safety to win the award since Jake Scott in 1973, the third defensive back overall (joining Scott and Larry Brown). The Super Bowl win came just before Jackson declared for free agency. The Pittsburgh Steelers had a verbal agreement to sign Jackson; however, he backed out at the last minute and signed with the Arizona Cardinals instead. The Steelers then went to "Plan B" and drafted Troy Polamalu. Jackson rejoined the Buccaneers in 2004, and played with them until the end of the 2005 season. 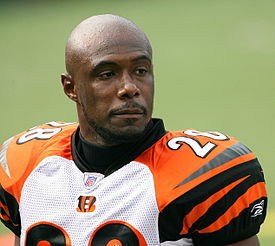 Before the 2006 season Jackson signed with the Cincinnati Bengals as a free agent. He played three seasons with the team before being released on March 6, 2009. Jackson finished his professional career with the Florida Tuskers of the United Football League. Jackson was among several former Buccaneers on the Tuskers' inaugural roster and played for the team for the 2009 season before retiring. Jackson currently coaches in the greater Atlanta area with the private coaching service, CoachUp. On September 19, 2011, Dexter Jackson and former World Boxing Organization cruiserweight world champion Tyrone Booze began a new radio show called "All Sports" with Randy Harris on Clearwater, Florida's WTAN AM 1340. The show is also aired on WDCF, WZHR and online on the Talking Sports Network. Jackson is married to Tina Jackson (of Miami, FL) and has four daughters: Jazmine, Daisia, Meah, and Taylor. Jackson currently works for the children's crisis center of Mental Health Care, Inc., a non-profit organization in Tampa. ^ name=Pro Football Reference "Dexter Jackson Stats". Pro Football Reference. Retrieved March 4, 2019.